A session with a bit of a difference. In this session, we're going to look at a walk up and across some mountains we recently did. As we travel along the journey, we'll look at some of the lessons that God can teach us. The reason we're doing this is that our Christian lives are like a journey. The disciples walked and talked with Jesus. They learned as they went. Sometimes in our churches people think that 'learning' and growing can only be done through a sermon or sitting in a building. But this just isn't true and isn't the life that Jesus or his disciples led! We start at the disused mine (near the top middle of the map). We'll then go up around Keppel Cove, to White Side, then up to Helvellyn Old Man and to Helvellyn. 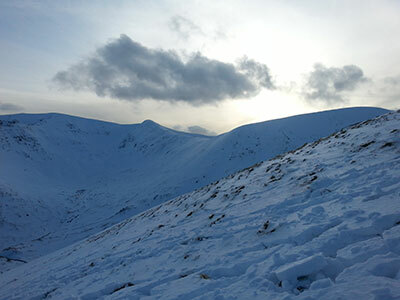 Then we can re-trace our route back down or go via the more tricky Swirral Edge around Catsyecam and back. The reality is that when you go up a mountain, you have to start from somewhere. As Christians, God works in us to help us become like him. We can get a bit down thinking things aren't happening or hear about the amazing ways that God uses other people. We have to remember we're a 'work in progress', growing in God ('from glory to glory' as the Bible says). So don't be too hard on yourself - God isn't !! 2 Corinthians 3.18 - But we all, with unveiled face, beholding as in a mirror the glory of the Lord, are being transformed into the same image from glory to glory, just as by the Spirit of the Lord. We also have to remember that with any mountain, there are lots of different ways up the mountain. One of my friends loves to go 'off piste' as she describes it, finding where there is no path and making a path! Others like to stick closely to the path. This isn't about 'coming off the path' of following God, it means that God works in each of us uniquely. Your journey of faith won't be the same as mine because God made us differently and does varied things in our lives to draw us closer to Him! Find people around you and a church who will encourage and challenge you while allowing you to be who God made you to be! Ephesians 2.10 - For we are God’s handiwork, created in Christ Jesus to do good works, which God prepared in advance for us to do. The 'walk in' to a mountain can sometimes start off a bit cold and a bit boring. All the time you have to keep enjoying the journey while you focus on where you're going (to the top!) Sometimes we get so focused on what we want that we don't appreciate what we have - we think about what we'd like to be and forget to enjoy where we are! The very best thing is to enjoy the life that Jesus came to give you (John 10.10) but with an eye on the 'one thing' (Jesus). Philippians 3.12-14 - Not that I have already obtained all this, or have already arrived at my goal, but I press on to take hold of that for which Christ Jesus took hold of me. Brothers and sisters, I do not consider myself yet to have taken hold of it. But one thing I do: forgetting what is behind and straining towards what is ahead, I press on towards the goal to win the prize for which God has called me heavenwards in Christ Jesus. There is a common joke from other people to me about how I'm always checking the map when out in the mountains! It's an on-going source of banter! But here's the thing - we need to know where we are in the mountains (when not using the map we've been lost!) And when the clag comes down (bad conditions) or when there's a whiteout in snow, you need to know where you are to stay safe! The same is true as Christians. We need to know who we are in God and to stay 'on the map', especially when difficult times come and you can't seem to see ahead of you! In the mountains if you don't know where you are, you can easily get lost or even worse! Psalm 25.4-5 - Show me your ways, Lord, teach me your paths. Guide me in your truth and teach me, for you are God my Saviour, and my hope is in you all day long. If you're anything like me, your map reading skills aren't perfect. We often get a bit off track (or very off track!) and sometimes we need people around us to help. Together we're stronger. So in our picture we see three people gathered around the map. When I carry a map in winter it's attached to me and I 'thumb' the map to check where I am. But unless you're carrying a GPS, you can sometimes still get a bit off track. In our Christian lives we can get things wrong (it's often better to try and be wrong then get back up, than it is to not try at all!) We sometimes slip over or perhaps can get a bit injured and need other people's help. The truth is that first of all we need The Guide - God. He is the one who has a plan for our lives and wants to direct us. Actually, apart from God we can do nothing! So just as I don't want to be without a map in the mountains, I don't want to be without God in anything! This means asking God to be in the centre of everything we do so that he can guide us in His will. John 15.6 - I am the vine; you are the branches. If you remain in me and I in you, you will bear much fruit; apart from me you can do nothing. There's also an art to navigation with lots of basic skills like using a compass and a map. Plus there are more advanced navigation skills that you can learn (like pacing and timing, two essentials in our Christian life too!) This reflects our Christian life where we learn new skills and grow in our knowledge of God and his ways of doing things! When you climb a mountain or walk up a mountain, you need to have the right resources to do what you need to do. These will change according to what you do, how far you go, who you're with, the weather and the time of year. 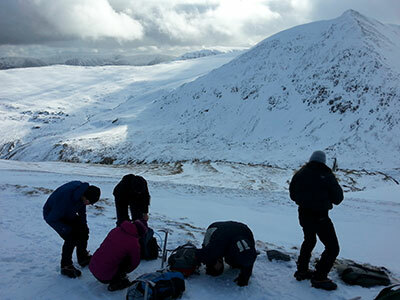 For example in snow and ice you'll need different kit than when you're in clear blue skies mid-Summer! I have had times where people have made funny comments about the outdoor kit I have. But one one recent winter day we all realised how important it is to have the right resources! 1 Corinthians 2.4-5 - My message and my preaching were not with wise and persuasive words, but with a demonstration of the Spirit’s power, so that your faith might not rest on human wisdom, but on God’s power. So when we're outside in the mountains we need the right kit. This includes clothing, rucksack, food, drink, spares, tools and accessories for the journey. Ephesians 6 reflects this in our Christian life, 'the armour of God'. You see, just like our mountain endeavours, our Christian life needs extra kit. In our Christian lives, this comes from God but we have a part to play too. So get armed and stay armed! Ephesians 6.14-18 - Stand firm then, with the belt of truth buckled round your waist, with the breastplate of righteousness in place, and with your feet fitted with the readiness that comes from the gospel of peace. In addition to all this, take up the shield of faith, with which you can extinguish all the flaming arrows of the evil one. Take the helmet of salvation and the sword of the Spirit, which is the word of God. And pray in the Spirit on all occasions with all kinds of prayers and requests. So here we are: we've walked in, we've checked the map and we've got the right kit and 'armed' ourselves with it. So now it's time for the ascent. Here the slope gets a bit steeper and we need to trust each other and put our equipment to good use (in our case, ice axes and crampons to grip on the snow and ice). We've looked at the verse earlier, but the Bible talks about our walk with God like an 'upward call'. When God spoke to Moses in Exodus, telling him to come up the mountain to speak to God (e.g. Exodus 24.12 and Exodus 34.2). The Christian life is like a journey. But this isn't any old journey. We don't want to go backwards. We need to fix our eyes on Jesus (see Hebrews 12) because this gives us a vision for life where Jesus is central and we walk upwards, forwards and onwards with him. You'll never climb a mountain if you don't put one foot in front of the other; you'll never reach the summit if you don't go upwards and put in the leg work and effort needed to get to the top. But when you get to the top the view will be amazing. This is the aim of our Christian life. One day will we will go 'up' to be with Jesus in heaven. So don't worry about your tired feet, blisters and hunger. The mountain of God is calling! Philippians 3.14 - I press on toward the goal for the prize of the upward call of God in Christ Jesus. One of the things on any steep slope in snow is the potential for an avalanche. An avalanche happens for many reasons. It can be caused by fresh (loose) snow lying on a layer of ice or neve below; it can happen after slightly warmer temperatures; it can be caused by strong winds. In the UK the most common kind of avalanche is what's called 'windslab' (you can see small examples of this in the picture - see the Powerpoint file). The most common trigger of avalanches is human action. This is important when we think about the spiritual principles of 'watching out for the windslab'. Right back at the start of the human race, the devil tricked Adam and Eve into disobeying God and stepping out of his will. He hasn't stopped this since. He blinds the eyes of people in the world against Jesus (2 Corinthians 4.4) and he even tries to deceive those of us who know Jesus. Matthew 24.24 (Jesus said to his disciples) - For false messiahs and false prophets will appear and perform great signs and wonders to deceive, if possible, even the elect (the church). When going up a steep slope it is common to dig an avalanche pit. This digs down to the deepest stable snow layer in the snow and looks at the layers in the snow to check whether the snow is stable or whether the slope is prone to avalanche. 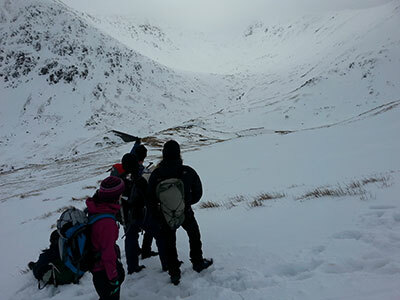 If the slope is an avalanche-likely slope, the walkers or climbers will go another way or even go back down. James 4.7 - Submit yourselves, then, to God. Resist the devil, and he will flee from you. 1 Peter 5.8-9 - Be alert and of sober mind. Your enemy the devil prowls around like a roaring lion looking for someone to devour. Resist him, standing firm in the faith, because you know that the family of believers throughout the world is undergoing the same kind of sufferings. But you have reached the top of the mountain; the highest point; the summit! When we reached the summit we were excited and buzzing! The view from the top was incredible. All around us we could see snow-covered peaks of the fells. The sun was shining, the air was pure and the beauty of God's creation was all around us. People were everywhere, enjoying the day together. Strangers greeted each other as friends. Dogs bounded around. 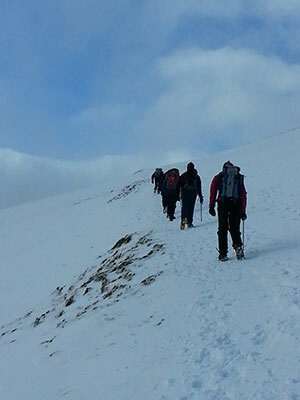 Snowboarders, skiers, climbers and walkers all came together across the 'summit'. This is like a picture of heaven which is a perfect place where there are people from every tongue, every tribe and nation. All those who have said yes to Jesus will be there, from across the planet and across time! It will be beyond anything you can imagine! Finally, we often hear about coming down from the mountain. Peter found himself on the top of a mountain with Jesus, Elijah and Moses (who all lived at different times in history - isn't it amazing how God goes beyond what we can figure out!) See Matthew 17.1-9 for when Peter suggested pitching their tent on the mountain top. 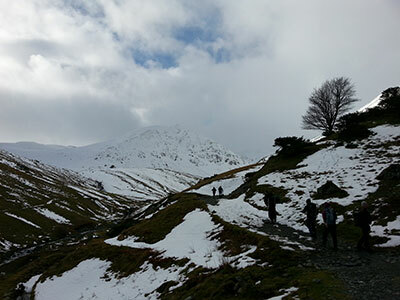 But they did come down the mountain as we did when we went on our Helvellyn trip. But here's the thing. Spiritually we don't have to 'come down the mountain'. We can have as close a relationship with Jesus as we want. We will have trouble in this world because Jesus told us we would. But he told us to take heart because he has overcome the world. We can live in the fullness of God's love. We can stay close to him and live Godly lives, never really falling away from God. Yes we'll have ups and downs and good times and hard times. But when Paul got to the end of his life he said that he'd stayed on track. He'd run his race and done what God called him to. We can be like that. We can be people who do what God tells us to all our life. 2 Timothy 4.7-8 - I have fought the good fight, I have finished the race, and I have remained faithful. And now the prize awaits me—the crown of righteousness, which the Lord, the righteous Judge, will give me on the day of his return. And the prize is not just for me but for all who eagerly look forward to his appearing. Here's the big question: there is a quote which people often say a famous preacher called DL Moody said. In fact, it was said by someone called Henry Varley and it's a challenge for us. Is this a prayer you are prepared to pray? Will you be that man? That woman?